We are excited to announce The Issa Trust Foundation’s 12th mission in partnership with the North East Regional Health Authority. 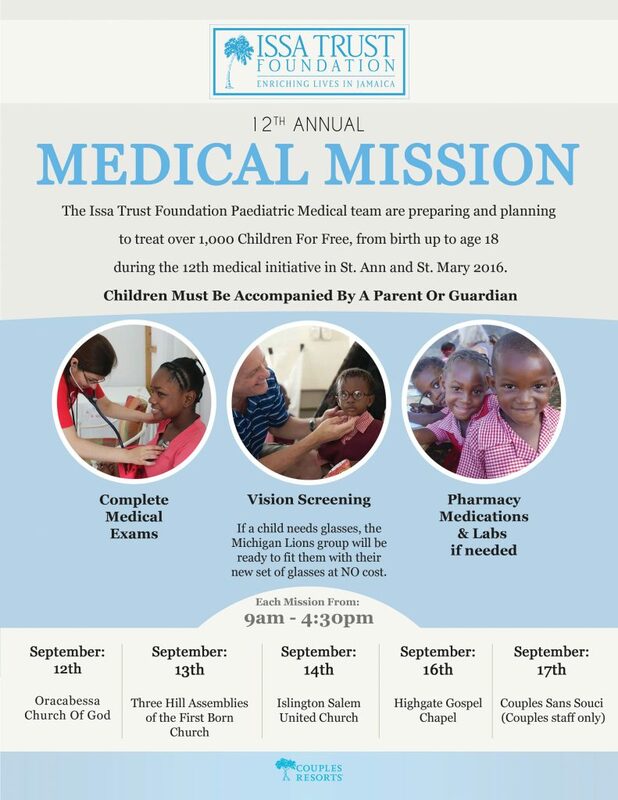 Annually, the Issa Trust Foundation sponsors a free pediatric medical mission in Jamaica. The 2016 team of 41 volunteers includes pediatric cardiologists, neonatologist, general pediatric nurses, physicians, and pharmacists are excited to serve the parish of St. Mary and St. Ann The team will be providing complete medical exams, laboratory testing, fluoride treatment and medications. In addition, children will be provided cardiology exam with an echocardiogram in the clinic if needed. As in past years, all children will receive free eye exams and receive their glasses immediately after their exam, provided by the Michigan Lions.